Aftermath is at last a good solid show at Tate Britain, rather than something anxiously politically correct, and equally anxious to demonstrate just how goody-two-shoes the Tate brand has become. This is a well-researched, well-argued project, with interesting things to say about what happened to European art during the period between the two World Wars, specifically to art in Britain, France, and perhaps above all in a defeated and broken Germany, as these nations emerged from the catastrophe. In fact, the emphasis is so much on Germany that the show might have been even more at home housed in Tate Modern. There has been a plethora of recent shows commemorating the centenary of World War I. This one differs from the rest, as its rather downbeat title suggests, by focusing on its conclusion and lingering consequences, rather than on immediate reactions to the conflict. Of the three major combatant nations featured here, only Britain had an officially appointed group of war artists. In France, some older non-combatants had intermittent access to the front. A case in point was Felix Valloton (1865-1925), a Swiss-born member of the turn of the century Nabis group, whose fine panoramic painting of a military cemetery, made in 1917, is included here, in the exhibition’s first section. However, the flourishing Parisian avant-garde of the year immediately preceding the war was notably cosmopolitan. Many of the artists living and working in Paris during the war years were not liable for conscription. They tended to shut themselves away and try to get on with their lives. Picasso, a Spanish national, was a case in point. It was nevertheless the disruption of the combats taking place on battlefields just out of sight that moved him away from his fractured Cubist style towards a reconsideration of the Neo-Classicism of early 19th century French masters such as J.-L David and Ingres. In connection with works of this type critics began to speak of a rappel à l’ordre – a summons back to an orderly state of things. There are a couple of beautiful examples of Picasso’s new neo-classical manner here. You have to look closely to see that one of them, Family at the Seashore (1922), might in fact be interpreted as an image of mourning. Where Germany was concerned, a number of leading artists saw service at the front, and some of them died. One who died was Franz Marc. Already well known, he was indeed officially identified as being a member of a group of artists who should be withdrawn from the front for their own safety. Before that could happen, he was struck in the head and killed instantly by a shell splinter during the battle of Verdun in 1916. He had no time to make art connected to the war, and he is not represented here. Aftermath George Grosz, Grey Day 1921. 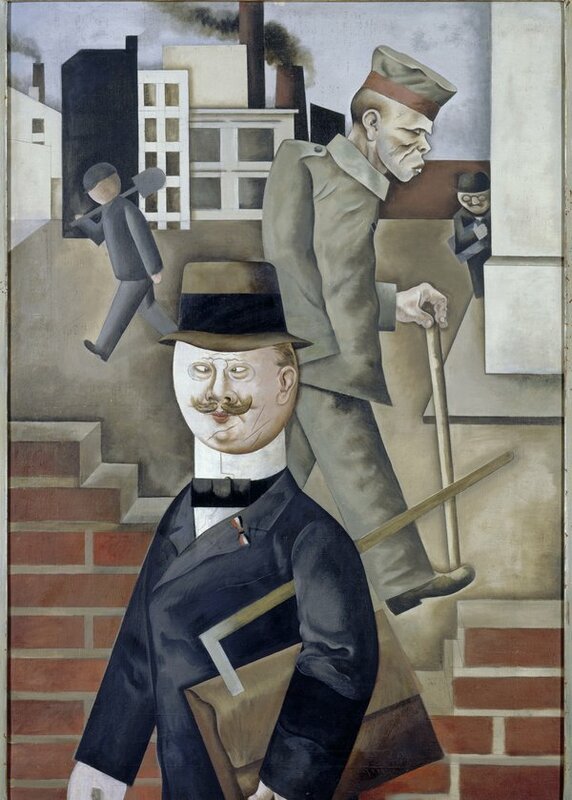 Nationalgalerie Berlin © Estate of George Grosz, Princeton, N.J. 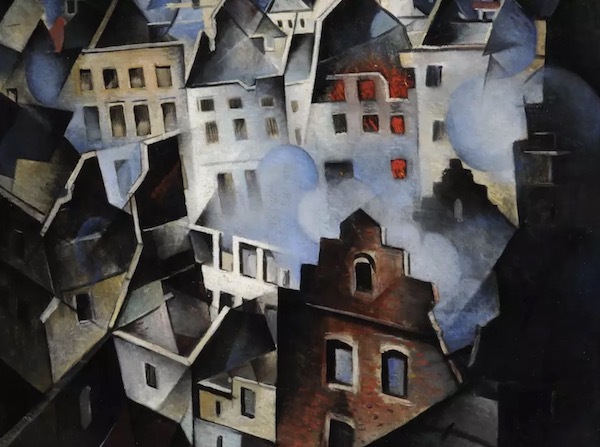 Very much at the core of the core of Aftermath are works by other German artists connected both to the Expressionist Movement to which Marc belonged, and to the Neue Sachlichkeit that succeeded it. Brutal, anguished, often terrifying, these reflect both the collapse of German society after the war, and, even more directly, they often portray the maimed and disfigured survivors clinging to survival in the streets of Berlin and other German cities. In doing so, they foreshadow the rise of Fascism, which was to be the long-term consequence of Germany’s defeat. One of the fascinations of the exhibition are the works of quite a number of socially engaged artists, mostly German, who are little known here in Britain. One of these, Otto Griebel, is represented by an impressive large composition of a crowd of workers, rank upon rank, singing the Internationale. Or, to be more precise, he is represented by a meticulous copy painted by his daughter, since the original canvas is now too fragile to travel. Another ‘resurrected work’, much more famous in this case, is Ernest Barlach’s war memorial sculpture, The Floating One (1927). Made to be suspended in the air, as a wingless mourning angel, this was condemned by the Nazis as ‘degenerate art’ and melted down. The moulds were preserved, and a new cast was made in 1987, almost fifty years after the artist’s death. They are both reminders of the essential fragility of works of art, regarded simply as physical objects. Yet another striking feature of the show is the quite large number of women artists included. Their work exists as of right within the context of what the show has to say as a whole. There is no sense that they have been forced in in order to make things politically correct. Some have always been major figures in the story of the Modern Movement. Among them, for example, Käthe Kollwitz. Others, such as the English artist Dod Procter, have faded gently from view. Tate owns a fine canvas of hers, which is exhibited here. Hung between two neo-classical Picassos, one the painting already mentioned, this effortlessly holds its own, despite the demanding context.